Steve Jobs changed the world forever with his innovative products, released as if they were all continuously moving along an assembly line for him to pick up at his leisure. His business savvy has also been celebrated and assuredly studied by aspiring businessmen, businesswomen and big thinking dreamers in their basements and even parent’s garages. The iMac computer is not owned solely by Americans, but by adults and children all around the world. And not just this Apple product either. Terms like iPod, iPhone, iPad, iMac and Macbook Pro are household names. Techies and millions of fawning fans alike listened to his every word whenever he casually strolled onto that plain stage in northern California with a wall-sized projection screen behind, clothed in his trademarked look: blue jeans, New Balance sneakers and his low-key black turtleneck. In hand was his next big device to make its grand premiere, ready for an exhilarating public test run. Rightly so, he is admired. In this age of increasing globalization, it was nice to say when he was alive that, ‘he’s one of ours….he’s an American innovator.’ It’s still nice to say. Walter Isaacson’s Behemoth of a book, “Steve Jobs,” details his life and includes just about any bit of information anyone would like to know about the man and technological icon. A movie is set to be adapted from this book by famed screenwriter Aaron Sorkin for a movie called, “Steve Jobs.” For those who are drawn to Jobs’ life and career, love dramatic stories as portrayed in cinema but can’t wait for this film to be released sometime down the road, they are in luck. Now come the vital questions that will surely be asked before and after the premiere: did director Joshua Michael Stern present the right details, milestones and key decisions to appropriately define the gigantic life of Steve Jobs through his multiple decades of leading Apple onto the top-shelf of the technological world? What overall theme and events did they decide to drive the story with? Is it accurate? Apple co-founder Steve Wozniak (“The Woz”) recently shared his reaction of the first released clip of “jOBS” as seen below to the website Gizmodo. “Not close…we never had such interaction and roles…I’m not even sure what it’s getting at…personalities are very wrong although mine is closer…don’t forget that my purpose was inspired by the values of the Homebrew Computer Club along with ideas of the value of such machines and Steve J. wasn’t around and didn’t attend the club so he was the one learning about such social impact of the future,” Wozniak said. One thing that can be agreed upon is that the final retort from Kutcher/Jobs excitedly foreshadows the empire the two of them would soon begin to build. It’s probably safe to say that this clip alone will generate a significant buzz of curiosity about the movie. Without seeing this movie in its entirety, it’s impossible to declare whether or not the script is misleading throughout or simply taking a little bit of artistic licensing, which does happen in Hollywood, for better and for worse. This could be the only hiccup or it could be first drip in a waterfall of inaccuracies. Until the lights go down and the movie is premiered, no fan/critic will know. The question is with his true life so fascinating and inspiring, why has such a step been taken for this important one minute scene? A few fortunate people will likely discover that truth tonight. I suppose that like any Apple product though, there will be the occasional bug. 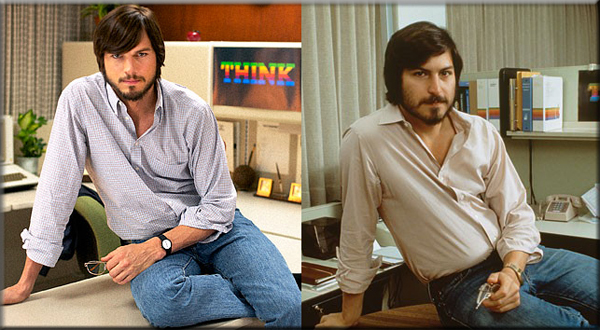 Maybe “jOBS” is just life imitating art? Come April 19th, will you give it a Friday night?